Writing in English is very easy. But writing in Hindi is vary difficult. Because computer's keyboard is in English language. Therefore it is difficult to type in Hindi with English keyboard. Some people easily type in Hindi, because they have done a Hindi typing course. But it is difficult for all to do Hindi typing course. So in this article i will show you how you can easily type Hindi. Now you most be thinking that how to type in Hindi. So i would like to tell you that you can type in Hindi with the help of google input tools. 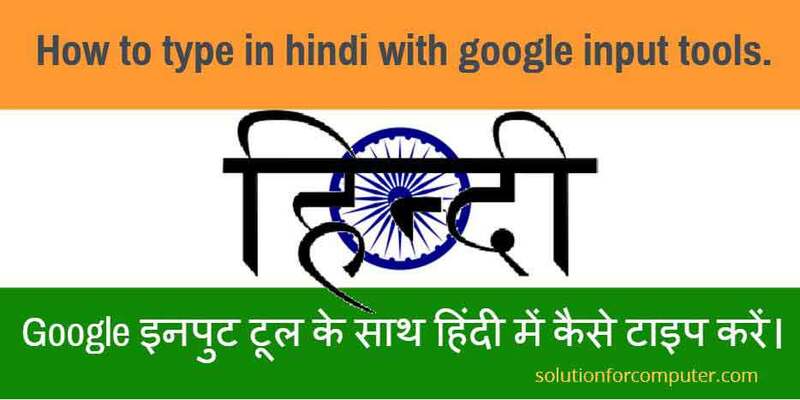 Google input tools from google that's help you to type easily in Hindi. How it works? When you type word in English then google input tools convert its automatically in Hindi. currently google input tools also available in 22 other language. So first you have need to download google input tools from internet. 1. When google input tools website is opened then select your language for example Hindi. 3. Click on download button and save google input tool in your computer. After download install google input tools in your computer. 4. When installation is complete click on EN in task bar and select Hindi language. 5. Now type in English language and see input tool convert your text to Hindi language. 6. Its also show you to some similar word like that you can select anyone word that's you want to type. I hope this article is helps you to typing in Hindi in your computer. If this article is helpful for you so please share this article on social media- Facebook, google plus, Twitter or other social media.